My Grandma Florence passed away 23 years ago, and when she died her antique menorah got placed in a closet in my parent’s home. This summer, my parents very very generously gave us the menorah, and this Chanukah we lit it for the first time in several decades. 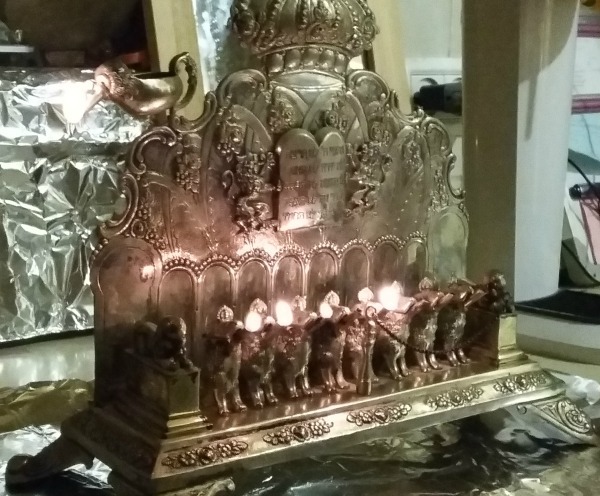 Lighting this menorah, in Jerusalem, the 8 candle-holders reflected by my 8 religious, Israeli children, I could not help but feel overwhelmed by the miracle of this life. I recently heard that when a person becomes a baal teshuva, it is because, somewhere in his family history, there is some serious zchut avot, major ancestral merit. 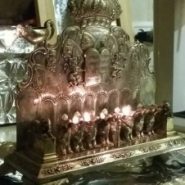 So looking at this menorah, passed down from generation to generation, I wondered about the origin of my personal zchut avot. Looking at the menorah, I flipped through my scattered memories of ancestors…a proud Jew who loved Israel with a passion, another who saved many Jewish lives when he enabled Jews to leave Europe for America, another who lived a traditional Jewish life when the vast majority of American Jews were turning their backs on their religion of several millenia. And then I thought of the hidden generations, the ancestors I’ve never heard of and never will, men and women who cried and prayed with all their hearts that all their children and children’s children, until the coming of Moshiach, would be good Jews who light up the world with Torah and mitzvot. And with the light of an antique menorah flickering in one Jerusalem home, serenaded by their never-seen, yet often imagined descendents– my children and me. So touching! The same I felt when we were 1st of my family who visited Jerusalem for the first time. I realized that was after 2 thousand years! Thank you for sharing your feelings. that is such a gorgeous menorah!!!! so glad it’s out of the closet!!! Happy Chanuka to you and all of am yisrael!